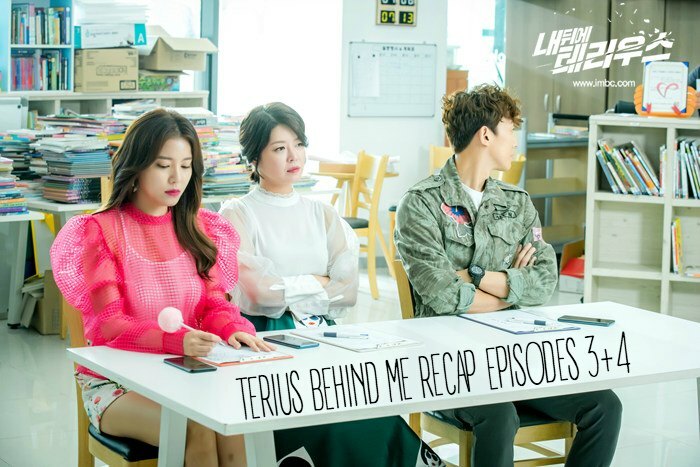 Here are Episodes 3 and 4 for Terius Behind Me! This show definitely got cuter once So Ji Sub became the bodyguard/babysitter. There are also some adorably sinister stickers floating around everywhere. But my absolute favorite part of these episodes where the Ajumma brigade that functioned even better than the NIS team. This show is a solid maybe. It is one of those shows where I am not sure if I will like it until many more episodes into it and would usually give it a few more episodes. Unfortunately, there are so many premieres dropping right now, so I am not sure if I want to dedicate that many more episodes to finding out if it will get good when I can just pick up another show that had a great first episode. Being on MBC is another negative because their shows usually take a nose dive; not withstanding Come and Hug Me which was good throughout. Soooo, we are on the fence about Terius Behind Me. We open at the funeral again. AR is with her Umma and is concerned with how to raise her children well. Her Umma gives her a veyr warm and comforting pep talk. She has been strong every since she was little. They cry and hug. That is the moment that SJS walked by and saw her. One moment later, he is spotted by agent Kwon Young-sil. Her and several other agents chase after him. AR finds out that her kids disappeared and takes off running right away. The bad guy has the kids. An ajumma walks by smiling, but he does not smile back. Ajumma thinks that guy is very suspicious, but keeps walking. Meanwhile, the agents find out that this mystery guy is definitely Terius, they must find him. Chase scene through the hospital. But Bon changed into a janitor uniform and walks out. However, he is a bit too confident, they spot him on the camera and know that he took a taxi. They follow via satellite. SJS feels something is up and tells the taxi driver to go to the tunnel. All the moms meet about the missing kids. 10 minutes has passed. EH tells all the ajummas to contact all their contacts about the kids and send all the photos to all the ajummas. One of the ajummas says that she saw the kids! She did nto feel good about the guy with them. It was 10 minutes ago. they update the ajumma network with the park. An ajumma takes a picture of the man with the kids and says she is in front of 207. The ajumma’s take off to the park! They keep texting back and forth to update. They spot him and point, GET HIM! Everyone runs after him. EVERYONE. They are able to save the kids. The man tries to dissapear but the Ajummas yell, GET THAT MAN. Meanwhile, the secret service is also on the hunt for Terius. they stop the taxi driver, but Terius escaped in the tunnel. Back with the ajumma’s, AR runs up to all of thema nd hugs her kids tearfully. ll the ajummas are still breathing hard and wondering what is going on. SJS gets out of another taxi just at K gets in. He feels something, but keeps walking and walks up on the ajumma scene with AR and her kids. The kids followed him because he told them that their mamma was crying over there. So they followed him. AR wipes her tears and says she is not crying, she is just sweating in her eyes. Umma will never ever cry so don’t follow strange men! SJS watches all of this, but the police show up so he hides his face. The ajumma network show the police this mans picture. Bon asks one of them if he can see the photo. He recognizes him and goes to his board. he identifies him as the magician. He puts a picture of the NIS chief, but wonders why he contacted his neighbor. He thinks he has to watch that house. Some time must have passed because AR took the job of delivering milk and also has a side job making kimbap. Bon keeps a close watch on her. At the NIS agency, JY lets her boss know that Terius disappeared. She wants to investigate why he showed up at that funeral. Elsewhere in the building, Do-woo tries to keep agent Young-sil from going somewhere by giving her a drink. But he did that to get her finger print so that he can find out who Terius is. He is very curious. he finds out a bunch of information about the North Korea nuclear weapon scientist that died and how Terius was accused of being an internal informer, but he escaped from his jail cell. Agent Kwon young-sil wants to find him at all costs. But JY thinks that Terius might not be a bad guy. Elsewhere, Bon pretends to be a security computer tech and looks up all the CCTV evidence from the night of the murders. But everything has been cleaned. AR goes to the car and sees that her husband bought cakes, but she thinks he is not the kind of person to buy that thing. It must be several days later because the cake is all moldy. EH shows up with the kids and talks a little bit to AR. AR thanks her for watching her kids. EH hopes she ges a lot of interviews, but AR says it is pretty difficult to pass the first stage. Meanwhile, YT is keeping tabs on AR. he wonders if there is any suspicion about her husbands death. His secretary tells him that there isn’t. At home, AR reads to her kids. They are all about to sleep together, but the kids start to talk about Appa, they miss . It looks like she told her kids that Appa is working far far away and will take 3 years to come back. She hasn’t figured out a way to tell them the truth yet. The next day, she gets a call telling her that she is hired at YT’s company. She is ecstatic. In a face to face meeting, she asks why he is giving her a second chance. She checks her salary, $50k a year! that blows her mind. He tells her to start next week. All the ajumma’s wonder how AR got a job. Sun-mi is a bit jealous, Sang-ryeol thinks it is a good opportunity for her. They ask about how the new helper is at the hagwon. Cut to an new nanny ajumma who is checking her phone instead of watching AR’s kids. She leaves the kids alone for a moment so Bon approaches her and asks what she is doing leaving those kids alone? he takes her cell phone and puts it on speaker phone. A lot of “I miss you honey” messages come out. The woman is all like, are you checking on me to see if I am watching these kids? AR walks up at that moment so the nanny accusses her of not trusting her. She points at Bon and says that she quits. She can’t work in this kind of environment. She points at Bon and tells her to hire him! He is spying on me anyway! AR asks Bon if it is true. Bon kind of stutters and says he was walking by and saw her leave the kids alone so he was worried, but he did not think this issue would become so big. AR understands that he had good intention. She is about to leave with her kids, but then Bon tells her, if she does not have enough time to find another nanny, can I do it? I can be the baby sitter. AR is all like, what? Cut to her apartment where Bon sits in a kids chair. he is stuck, lol. The kids give him play coffee and food. Please eat it. Then they stare at him. Bon looks at them for a moment, then realizes that he has to eat the fake food. He gets a heart. The boy asks why he isn’t eating his? Bon thinks this gummy is so dirty, but maybe he will be sad if he does not eat it? He takes it. AR runs in immediately notices that SJS ate something her son gave him. She says this is the first time someone ha done that. She asks him where he picked it up, the toilet? The floor? Bon gags. He says he got it from the playground. AR gives Bon a yogurt to drink and tells him to let her know if he has stomach pain. he hesitantly drinks it and looks like a little kid. Then she breaks it to him that she does not know him that well so maybe he should not be her nanny. he says he was looking for a small job. She can hire him for a few days until she finds a real nanny. AR starts to consider this. Bon goes home and tells himself that he was succesful in getting close to 804. He starts to put the clues together about AR’s husband, he worked at a publishing company. But there is nothing too suspicious about the house, it was just too messy. But something bothers him. Cut to K, he uses the heart sticker as survelance, but it is in all the wrong houses. he gave a sheet of stickers to the kids to put it in their house, but the kids gave it to all their friends on the bus. So everyone has a sticker. Bon even has a sticker. Bon listens to a song and remembers the time 3 years ago in Poland. K was also there listening to the same song. It is AR’s first day. YT tells her the ins and outs on the business. They import bags. He walks hre around and tells her that there is a cafe on the first floor, he starts his day with it. He wants a drip coffee before he starts work. then he tells her about the flowers on the table. He wants new flowers every 3 days. Beauty is important for him, so please take care of it. Also, lunch is important for me, ask me at 11 what I want and reserve the restaurant by 12. That is it. She memorizes it all without writing anything down. She tells him that she can do a lot of work on the computer as well. She is good at Word, Excel, everything. But he tells her that he does all the computer work and she is not allowed to go into a certain room. She heads off to get his coffee but trips over her heel once again. Meanwhile, at SJS’s house, he hears a ding dong on the bell and grabs his gun. But when he looks out of the peep hole all he sees are the three main ajumma’s. He opens the door to their smiling yet stern faces. Cut to a pressure interview for the babysitting job. The ajummas tells Bon that they are practically AR’s family and are checking on him for the job. They ask about his jobs and the military he went to. Bon has this internal dialogue where he questions all the questions. He says he did not go to the military and he does not have a job. The last round of questions is about kids. She says some kind of child activity that only parents know about. SJS gets it wrong. EH tells him that he is all done and can leave. Bon gets up, but he asks what the answer is to the question. Sang-ryeol replies. After English school , go to the cultural center and taekwondo and art? But the sentence was a shortenned acronym for all of that. At work, YT asks AR if she would like to have a welcome party? She does not want to but thinks that she has to because he will tll her that he cannot work with ajummas and kids. Back to the ajumma bus pickup. SJS has the job as nanny and is waiting for the kids at the bus stop with all the ajummas. He wears shades. The ajummas are losing their mind over him. One of them gives him a drink, but another one cuts in to give the drink also. The kids show up and are stunned that ajusshi is really there. He smiles and takes them to the park. The ajummas continue to be mesmerized with him because he looks like a model. But the little kid goes down the slide like super man so Bon tells him to do it properly. the little boy says that is no fun. he asks them what is fun. Riding Ajusshi down the slide is the most fun so they do that several times until Bon is spent. Sang-ryeol tells him that he has to say no or Joon-soo and Joon-hee will never stop. He tells them they can all have a snack. Later on, Bon eats with the kids at their house. AR made all three of them a very cute meal complete with a egg heart and octopus sausage. SJS eats the food as if he is very touched by the effort. AR calls as they are eating and lets him know that she will be a little late. He tells her it is no problem. Right now, AR is at the welcome dinner. AR asks about the bag, but he tells her that they should not talk about work. He tells her that she can look at her face if she wants to work. She immediately thinks he must he a pervert and tries to drink something to not look so stunned. The converstation changes to her husband, but she says her husband is at home. YT wonders why she said he is at home. Meanwhile, agent Ra and agent Yoo drink coffe and juice outside. he asks her about Terius but tells her that he knows everything. He just wants to hear her personal opinion. She says he is a legendary black agent. He is good at all the spy stuff. While she talks, we see Bon working as a nanny in a lot of hilarious nanny jobs. He is good at fighting and changing his Identity, but he was the best at swaying the informer. SJS tells the kids they have to brush their teeth, they don’t want to, so he sways them to follow his way. the loser has to brush their teeth, the winner does not. the kids ask what kind of game it is. Cut to them doing pushups. The kids have to do 10. The boy wins so the girl has to brush her teeth. SJS helps her brush them the right way and makes sure that she gets them all super clean. When they come out, the boy is out on the play floor. He is super nocked out in whatever way he fell. The sister says she is sleepu as well, so he tucks them both in and closes the door. With the agents, DW asks if Terius dated the informer, thta was illegal right? JY says he did, but love is like that. AR gets home, the kids are already sleeping. She is stunned that they are asleep and wonders if it was hard. he tells her that they were tired. He excuses himself to go home. But she stops him and asks if he can be a full sitter. He says yes so they introduce themselves to each other formally. She thanks him and says she is looking forward to working with him. YT jogs along the river until he meets with K. He tells him that there is nothing on the husbands side. Then they talk about some equipment that they need to take out. Back at the apartment, EH find out that her childs bike was stolen. She checks the CCTV and notives one of the people in it. It is the day that the husband died. AR gets a call to show up to the CCTV. Bon goes there as well. They think the video is strange, AR’s husband was being followed by someone. Maybe…your husband was killed? Cut to K, he is removing all the equipment. But he hears the ajummas talking because the security guard office has a sticker as well. A solid second days episodes. I am not gripped by what is happening, but I do like what is going on. Unfortunately, this show is pretty campy to the nth degree so I don’t really know where to place it which puts it in strong maybe territory, so we might or might not continue with it. It really all depends on the other drama’s premiering this week. Image from MBC and edited using PicMonkey.